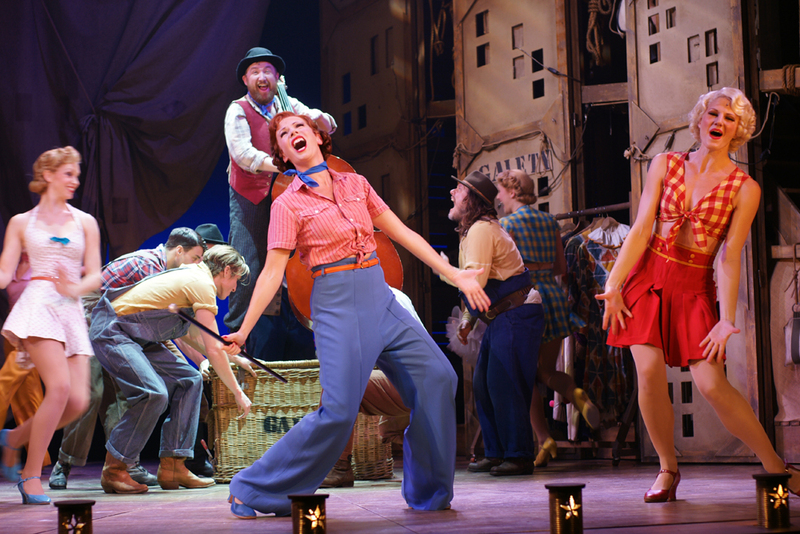 Fresh from its successful run at the Regents Park Open Air Theatre, Crazy for You has since transferred to the Ivor Novello Theatre. It seems a suitable home for a production that showcases the best of the 1930’s musical songbook. Whilst Novello contributed to a very British version of the musical comedy that had little in common with his American counterparts, Crazy for You’s chorus line routines, zinging one-liners and infectious melodies would appear to be closer to his taste than the overblown power chords, million pound sets and star billing of the modern day musical. It is both interesting and depressing to note Shrek: The Musical is in residency just two hundred metres up the road, and a stone’s throw from the Royal Opera House. Having seen the show in its original run, it is interesting to make comparisons between the two. The Open Air Theatre is a daunting place to stage a show; the director needs to battle a large auditorium where small. intimate gestures are likely to be missed but without access to the same range of special effects and staging techniques available in a more traditional space. There have been a few alterations during the transfer to the Novello, clearly with the aim of giving the show a little more spectacle, but these are only minor and there is a pleasing sense that there has been a deliberate decision to stay true to the spirit of the period. Whether it is due to being staged indoors, in more familiar surroundings, the dancing has become noticeably tighter. The routines have been slightly rechoreographed for the smaller stage and the chorus line display a uniformity and invention that is a necessity for reviving the true spirit of Broadway. Sean Palmer, who plays Billy Childs, the everyman hero, has markedly improved. Previously it had been a good show but one that questioned whether there was still the talent to really do justice to the style of 1930’s dancing, however Palmer has stepped up and there is a real energy to the routines, whilst the stage crackles with energy when Billy and Polly (Clare Foster) are together; notably in their number, Shall We Dance? One disappointment is that the opening fifteen minutes are quite flat. It isn’t until Billy gets packed off to Nevada that the show really gets going, the numbers become inventive and the jokes start sticking with the audience – a special mention should really go to Kim Medcalf and Michael McKell, as Irene Roth and Lank Hawkins, the voluble and volatile source of much of the quick-fire dialogue. However flat the opening, a show that raids the Gershwin’s back catalogue is never going to stay dull for long. Any musical delivering a first-half that runs through ‘Someone to watch over me’, ‘Slap that Bass’, ‘Embraceable You’ and ‘I Got Rhythm’ without pausing for breath is going to struggle to lose the audience’s interest. Further proof of the Gershwin’s innate understanding of the audience is the noticable shorter second half that efficiently wraps the plot up without too many convoluted twists. Overall Crazy for You is as lightweight as it was when it was written. It is charming and fun but at times it does begin to creak. The jokes can be seen a mile off and it would be interesting to see the modern day dancers go head-to-head with the 1930’s lines they are mimicking. Having said that, Crazy for You does cocoon you in a warm nostalgia-fest that is right on trend alongside Downtown Abbey, the revival in arts and crafts and the rise of the gin cocktail. One issue is that it provides yet more evidence of the moribund nature of the modern musical. Whilst praising Andrew Lloyd-Webber is near the bottom of my list of priorities, at least Cats and Starlight Express could claim to be truly original; the current range of musicals imported from films, compilation albums or back-catalogues points to a West End theatre scene running full tilt towards the lowest common demoninator. In a year where London Road and Matilda provided radically different takes on a new musical, Crazy for You can seem a little too conservative.